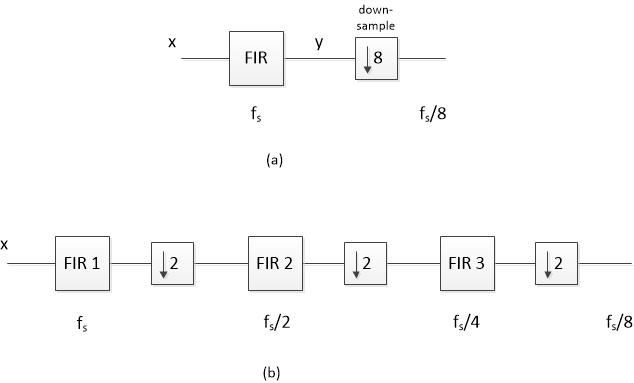 Figure 1a shows the block diagram of a decimation-by-8 filter, consisting of a low-pass finite impulse response (FIR) filter followed by downsampling by 8 . 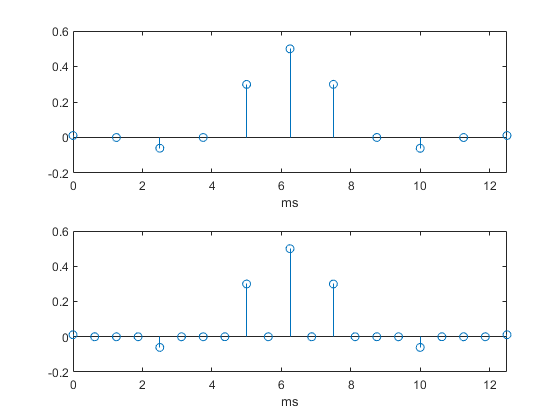 A more efficient version is shown in Figure 1b, which uses three cascaded decimate-by-two filters. This implementation has the advantages that only FIR 1 is sampled at the highest sample rate, and the total number of filter taps is lower. The frequency response of the single-stage decimator before downsampling is just the response of the FIR filter from f = 0 to fs/2. After downsampling, remaining signal components above fs/16 create aliases at frequencies below fs/16. 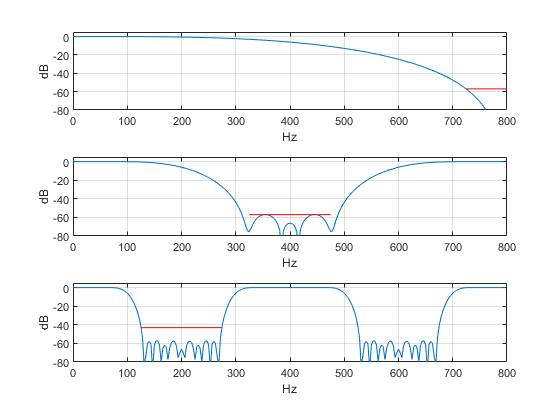 It’s not quite so clear how to find the frequency response of the multistage filter: after all, the output of FIR 3 has unique spectrum extending only to fs/8, and we need to find the response from 0 to fs/2. Let’s look at an example to see how to calculate the frequency response. Although the example uses decimation-by-2 stages, our approach applies to any integer decimation factor. Figure 1. Decimation by 8. (a) Single-stage decimator. (b) Three-stage decimator. Figure 2. Frequency Responses of halfband decimation filters. Figure 3 shows the coefficients b2 and b2_up. The code has inserted samples of value zero halfway between each of the original samples of b2 to create b2_up. b2_up now has a sample rate of fs. But although we have a new representation of the coefficients, upsampling has no effect on the math: b2_up and b2 have the same coefficient values and the same time interval between the coefficients. Figure 4 shows the coefficients b3 and b3_up. Again, the upsampled version is mathematically identical to the original version. 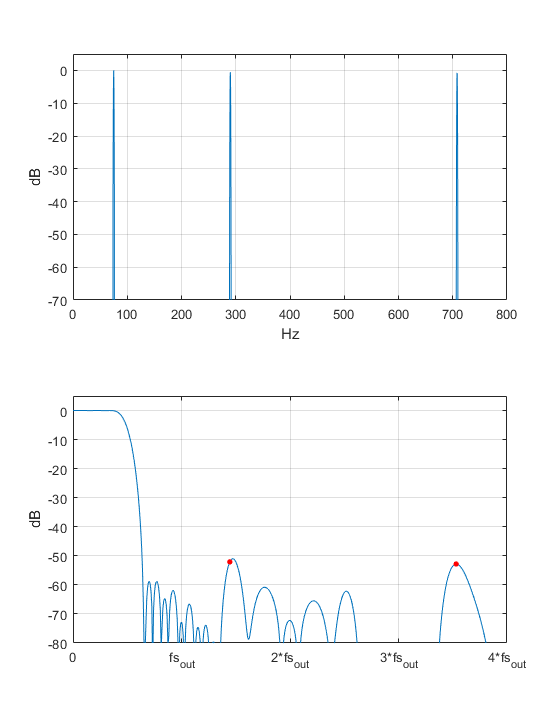 Now we have three sets of coefficients, all sampled at fs = 1600 Hz. A block diagram of the cascade of these coefficients is shown in Figure 5. Figure 3. Top: Halfband filter coefficients b2. Bottom: Coefficients upsampled by 2. Figure 4. Top: Halfband filter coefficients b3. 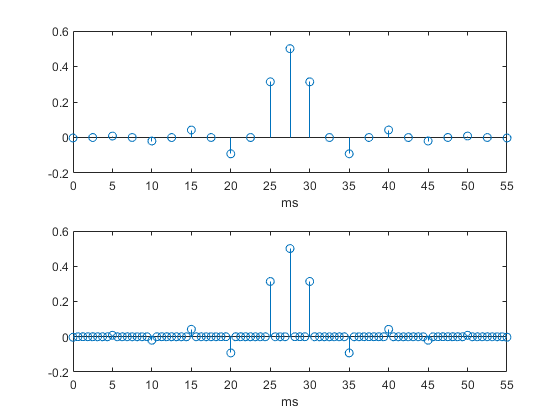 Bottom: Coefficients upsampled by 4. Figure 5. Conceptual diagram showing cascade of FIR 1 and upsampled versions of FIR 2 and FIR 3, used for computing frequency response of decimator of Figure 1b. 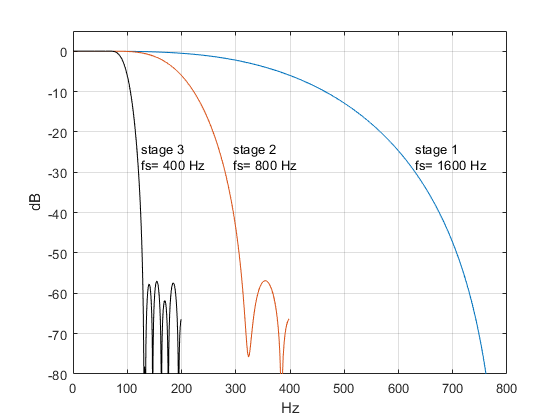 Using the DFT, we can compute and plot the frequency response of each filter stage, as shown in Figure 6. Upsampling b2 and b3 has allowed us to compute the DFT at the input sampling frequency fs for those sections. The sampling theorem  tells us that the frequency response of b2, which has a sample rate of 800 Hz, has an image between 400 and 800 Hz. Since b2_up has a sample rate of 1600 Hz, this image appears in its DFT (middle plot). Similarly, the DFT of b3_up has images from 200 to 400; 400 to 600; and 600 to 800 Hz (bottom plot). 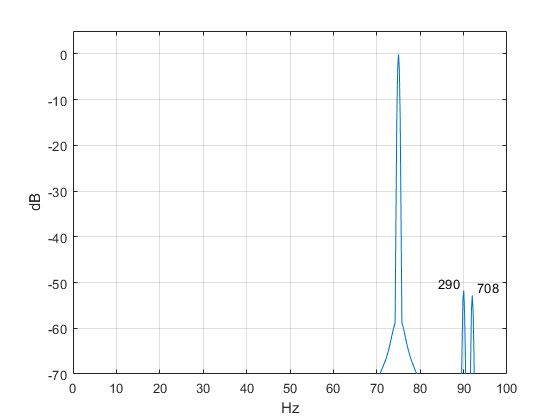 Each decimation filter response in Figure 6 has stopband centered at one-half of its original sample frequency, shown as a red horizontal line (see Appendix). This attenuates spectrum in that band prior to downsampling by 2. Figure 6. Frequency responses of decimator stages, fs = 1600 Hz. The impulse response is plotted in Figure 7. It is worth comparing the length of this response to that of the decimator stages. The impulse response has 115 samples; that is, it would take a 115-tap FIR filter to implement the decimator as a single stage FIR sampled at 1600 Hz. Of the 115 taps, 16 are zero. By contrast, the length of the three decimator stages are 7, 11, and 23 taps, of which a total of 16 taps are zero. So the multistage approach saves taps, and furthermore, only the first stage operates at 1600 Hz. Thus, the multistage decimator uses significantly fewer resources than a single stage decimator. 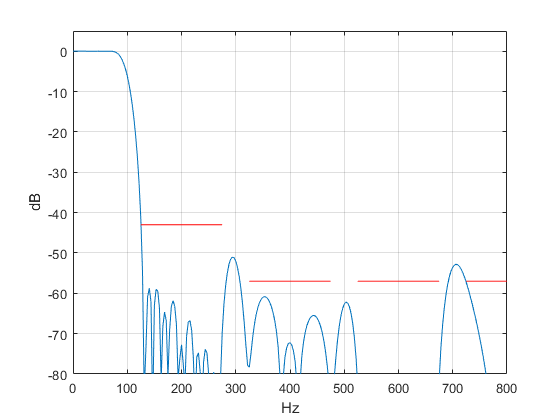 The frequency response magnitude is plotted in Figure 8, with the stopband specified in the Appendix shown in red. Upsample the coefficients of all of the decimator stages (except the first stage) so that their sample rate equals the input sample rate. Convolve all the coefficients from step 1 to obtain the overall impulse response at the input sample rate. Take the DFT of the overall impulse response to obtain the frequency response. Our discussion of upsampling may bring to mind the use of that process in interpolators. As in our example, upsampling in an interpolator creates images of the signal spectrum at multiples of the original sample frequency. The interpolation filter then attenuates those images . We don’t want to forget aliasing, so we’ll take a look at that next. Figure 7. Overall impulse response of three-stage decimator at fs = 1600 Hz (length = 115). Figure 8. Overall frequency response of Decimator at fs= 1600 Hz. So, after decimation, we expect a component at 90 MHz that is about 52 dB below the component at 75 Hz, and a component at 92 Hz that is about 53 dB down. This is in fact what we get when we go through the filtering and downsampling operations: see Figure 10. Note that the sines at 290 and 708 MHz are not within the stopbands as defined in the Appendix for FIR 1 and FIR 2. For that reason, the aliased components are greater than the specified stopband of -57 dB. This is not necessarily a problem, however, because they fall outside the passband of 75 Hz. They can be further attenuated by a subsequent channel filter. Figure 9. 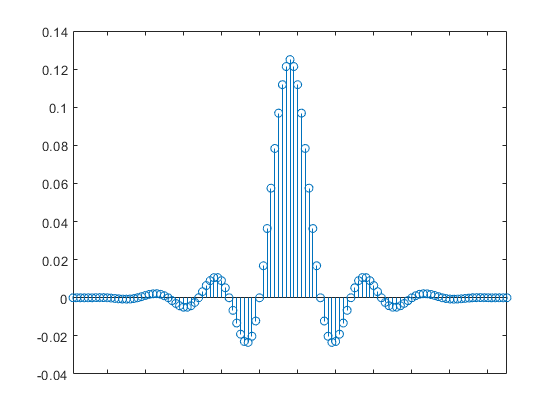 Top: Multiple sinusoidal input to decimator at 75, 290, and 708 Hz. Bottom: Decimator overall frequency response. Note fs out = fs/8. Figure 10. Decimator output spectrum for input of Figure 9. fs out = fs/8 = 200 Hz. The halfband decimators were designed by the window method  using Matlab function fir1. We obtain halfband coefficients by setting the cutoff frequency to one-quarter of the sample rate. The order of each filter was chosen to meet the passband and stopband requirements shown in the table. Frequency responses are plotted in Figure 2 of the main text. We could have made the stopband attenuation of FIR 3 equal to that of the other filters, at the expense of more taps. Note that the filters as synthesized by fir1 have zero-valued coefficients on each end, so the actual filter order is two less than that in the function call. Using N = 6 and 10 in fir1 (instead of 8 and 12) would eliminate these superfluous zero coefficients, but would result in somewhat different responses. % resulting coeffs have zeros on the each end,so actual filter order is N-2. Lyons, Richard G. , Understanding Digital Signal Processing, 2nd Ed., Prentice Hall, 2004, section 10.1. Mitra, Sanjit K.,Digital Signal Processing, 2nd Ed., McGraw-Hill, 2001, p 701-702. Oppenheim, Alan V. and Shafer, Ronald W., Discrete-Time Signal Processing, Prentice Hall, 1989, Section 3.2. Lyons, Richard G. , Understanding Digital Signal Processing, 2nd Ed., Prentice Hall, 2004, section 10.2. This is a great blog. Your Figure 10 shows a very important principle that we sometimes forget. That principle is: After decimation by 8, *ALL* of the spectral energy that exists in the freq range of 0 -to- 800 Hz in the filter's output in Figure 8 is folded down and shows up in the decimated-by-8 signal's spectrum that you show your Figure 10. Good job! Thanks Rick, I appreciate the encouragement!